Trampolines inspire a lot of backyard fun and kids can spend hours jumping on them. However, with all of that fun comes a serious safety risk. Should you choose to have a trampoline or visit a home with a trampoline, you can take steps to increase your children's safety while they jump. The American Association of Pediatrics (AAP) discourages recreational trampoline use and the American Academy of Orthopaedic Surgeons (AAOS) recommends limited use of trampolines and even advises against use of trampolines in children under 6. Not only can children break bones, but if your trampoline injures another child you could face liability issues. Whether buying a trampoline of your own or enjoying a friend's trampoline, you should pay attention to a few key features before jumping or allowing your children to jump. Check the springs. Make sure all springs are securely attached to the trampolines. Loose springs cause the way the trampoline moves and could cause a child to fall off the trampoline if they come unattached while in use. Missing springs could also cause the jump mat to tear. Look at the mat. Double check the mat to make sure it's free of holes and tears. While duct tape may cover up a problem, it won't change the way a trampoline responds when it is torn. It loses a bit of its spring and could cause a harder landing, leading to more problems. Make sure it's level. A trampoline on unleveled ground can cause problems for jumpers and make it easier for them to fall off or land awkwardly as they jump. Clear off the trampoline. A trampoline with leaves, sticks, or even toys on it becomes an unsafe trampoline. Remove all items from the trampoline so kids don't trip over these items while they jump. While you're at it, you can also make sure the area around the trampoline is clear of branches or other things kids could knock into as they jump. Adding accessories to a trampoline can help make it safer. Cover the springs and edges of the trampoline with padding so children cannot slip and fall through the space between the springs. The padding will also make the edges of the trampoline softer and reduce injuries when kids fall. To prevent kids from falling off the trampoline entirely, you can install a safety enclosure net around the trampoline. However, make sure the bars of the net are well padded to keep other injuries from occurring. Opting to put your trampoline in the ground can also help reduce injuries by cutting down on the distance from the jump mat to the ground. Special kits can help you complete the task on your own or you can hire a professional to get the job done. Despite all of the precautions taken before jumping, the real risk of injury happens when kids are on the trampoline. Accessories such as padding and safety enclosure nets can give parents a false sense of security, letting children jump on the trampoline without supervision. No matter how safe the trampoline appears to be, adults should always supervise children as they jump. Along with supervision, you should establish clear rules for jumpers. While the AAP advises against trampoline use, it does offer a few suggested rules for parents who opt to have a trampoline at home, the main one being allow only one child on the trampoline at a time. This is because most trampoline injuries occur when multiple children are on the trampoline at the same time. Older kids must stay off the trampoline while younger kids jump. No one under the influence of alcohol or drugs allowed on the trampoline. While kids may not like these rules, they'll help prevent injuries, making the trampoline safer and more enjoyable for others. Most injuries that occur involve sprains and breaks in the arms or legs. But while broken bones account for a large number of trampoline injuries, kids can also end up with concussions or other head and neck injuries that could lead to paralysis. Enforce the one jumper at a time rule. It won't be as fun for kids, but since most injuries occur with multiple jumpers, it's the best way to reduce the risk. Put the kibosh on any stunts on the trampoline. Somersaults, flips, funky kicks, and other crazy jumps look cool, but land the wrong way and it could lead to a broken bone or a more serious head or neck injury. 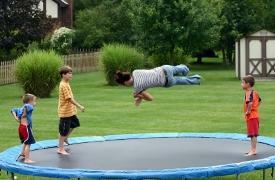 If you don't have a net on the trampoline, have kids jump near the center of the mat. Set time limits on jumping to keep kids from jumping while tired and, therefore, putting themselves at greater risk of injury. You may have a trampoline in your yard to help make it a fun place for your kids to play, but one injury could ruin the fun for everyone. Even though kids may not like only jumping one at a time and avoiding stunts on the trampoline, remind them that safety comes first. The trampoline can provide long-lasting fun even if everyone follows the rules.